If the U.S. Congress rejects the Iran nuclear deal, that could destabilize the country’s relations with allies on other crucial issues, Secretary of State John Kerry warned Tuesday. 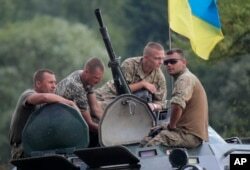 Ukrainian soldiers atop an APC watch training exercises under the supervision of British instructors on the military base outside Zhitomir, Ukraine, Aug. 11, 2015. "That is a recipe, quickly, my friends, for them to walk away from Ukraine, where they are already very dicey and ready to say, 'Well, we have done our bit,'" said Kerry, referring to efforts to support the Ukrainian government in its fight against Russian-backed rebels. He spoke during an Iran nuclear discussion hosted by the Thompson Reuters media company. Congress has 60 days to review the Iran nuclear deal, known as the Joint Comprehensive Plan of Action (JCPOA). Lawmakers can pass a resolution of approval or disapproval or take no action. President Barack Obama has said he will veto any vote of disapproval, but his veto could be overridden by a two-thirds vote of Congress. As Obama administration officials make their case for the agreement, a host of Republican and some Democratic lawmakers have voiced concerns about the plan, including Democratic Senator Chuck Schumer of New York. Last week, Schumer announced he would vote against the deal, which he said would let Iran achieve its "dual goals" of eliminating sanctions while retaining nuclear and non-nuclear power. But Kerry said it could hurt U.S. foreign policy if Congress ultimately kills the deal. It was negotiated and backed by the U.N. Security Council’s permanent members – Britain, China, France, Russia and the United States – plus Germany, otherwise known as the P5+1. "If the United States were to behave that way, not only would we have lost them with respect to the sanctions, we will lose their support if we have to use military action," Kerry said. In July, Iran and the P5+1 agreed to a plan that requires Tehran to limit uranium enrichment and comply with International Atomic Energy Agency inspections in exchange for relief from crippling sanctions. The deal includes so-called "snap-back" provisions for sanctions, if inspectors determine that Iran has cheated. Kerry said it is a "good deal" that "gets the job done." Obama has suggested that much of the stiff Republican opposition to the deal is political. “Unfortunately, a large portion of the Republican Party, if not a near-unanimous portion of Republican representatives, are going to be opposed to anything that I do,” he said in a Monday interview with NPR. Critics of the deal include Senator Lindsey Graham of South Carolina, a contender for the Republican Party's presidential nomination. “At the end of the day, there is a better deal awaiting the world and the United States with a new president,” Graham said following a July briefing by Kerry. On the other hand, the Obama administration picked up support on Monday from Democratic Senator Amy Klobuchar. She said a congressional vote against the deal would allow Iran to continue “destabilizing activities” while pursuing nuclear weapons. A group of 36 retired generals and admirals also expressed their support in an open letter that called the agreement "the most effective means currently available to prevent Iran from obtaining nuclear weapons." "America and our allies, in the Middle East and around the world, will be safer when this agreement is fully implemented," the officers said.